MIDDLEBURY, Vt. -- You can call the Colby College women's lacrosse team New England Small College Athletic Conference champions. The fifth-ranked Mules (15-3 overall) won their 13th straight game and their third conference title with a stunning six-goal run to turn a 9-7 deficit into a 13-9 victory over Trinity College on Sunday at Middlebury College. "The whole game I never felt worried," said Colby tri-captain Emilie Klein, who had four goals. "The entire team plays with such composure. We really focus on ourselves and we don't worry too much about who we are playing. I think that helped us in this game. Colby clinched the automatic bid to the NCAA Division III Tournament and will find out tonight at 9:30 who they will play next. The Mules won back-to-back NESCAC titles in 2008 and 2009 under head coach Karen Henning. Colby evens its record in league championship games to 3-3. The Mules fell in 2007 under former head coach Heidi Godomsky. Henning went to four straight title contests from 2008 to 2011, losing in 2010 and 2011. The loss in 2011 was a 7-1 setback to Trinity. The Bantams (14-4) have competed in the last seven NESCAC championship games. Trinity came into today's final with a 5-1 record, winning five straight before falling 10-7 to Middlebury last year. Trinity had an impressive individual display by junior attacker Kiley Coffey, who tied a NESCAC playoff record with seven goals. Coffey is now tied with Colby graduate Amy Campbell '10, who had seven goals in a quarterfinal game in 2009. Campbell also held the tourney record of 13 goals, but Coffey surpassed that mark with 17 goals in three playoff games. Colby's six-goal run was ignited by winning draw controls. The Mules had a 15-9 advantage for the game, but Colby won five of the last six draw controls in the second half. The Mules also had success on draws against Middlebury in a semifinal victory. "Having more than one person who can take the draw has been big for us the last two games," said Colby tri-captain Georgia Lubrano. "They talk to each other and figure out who might have the best chance to win a draw. We also have girls around the circle who hustle and put everything on the line to get that ball. Coffey scored her seventh goal with 17:39 remaining to give the Bantams a 9-7 lead. Gemma Bready, who had her best collegiate game, started the Colby scoring run at 14:49. Bready had two goals, five draw controls, three caused turnovers, and two ground balls. "Gemma has been playing like this all year long," Henning said. "She doesn't get all the publicity, but everyone on this team knows how important she is to us." After a draw control win by Grace Crowell, Sasha Fritts scored just 56 seconds later to tie the game at 9-9. Fritts had two goals and three assists, with two coming on the final two goals of the game. The next draw control was won by Kendall Smith and she turned it into the game-winning goal only 38 seconds after Fritts' goal. Smith, who had three goals and one assist, tallied off a free-position shot with 13:15 remaining. Crowell won another draw control and Smith scored her second straight goal with 12:31 remaining for an 11-9 margin. Madeleine Hatch was to the left of the goal and was eyeing Smith in front. Smith made a slight adjustment to create space and Hatch found her for the goal. Klein won the next draw control, but the draw did not lead to a Colby goal. Trinity had a chance to cut the margin to one goal, but Klein forced a turnover with 11:47 to play. 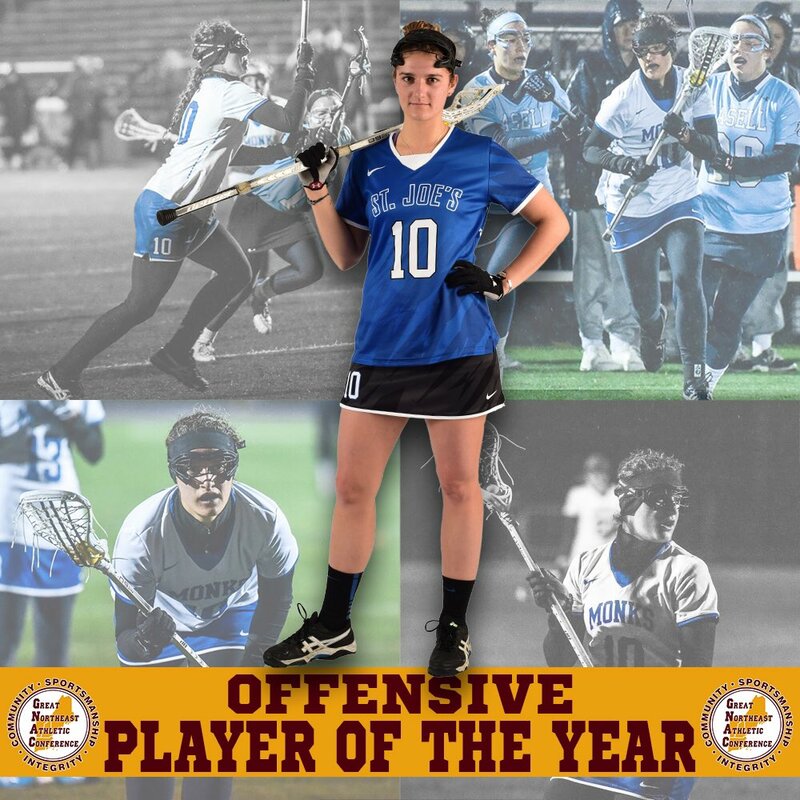 Klein, the NESCAC Defensive Player of the Year, then scored off an assist from Fritts with 10:45 remaining for a 12-9 lead. Colby scored five goals in a span of 4:04 to take the three-goal margin. The Bantams finally won a draw control only to see Colby All-American defender Jackie Brokaw cause a turnover with 10:10 remaining. The Mules decided to spread out the field and did an excellent job killing valuable minutes off the clock. Hatch closed out the scoring with a low shot off a feed from Fritts with 6:01 left. The rest of the game was turnovers for both teams. Lubrano had a caused turnover with 1:14 to play. The Mules got off to a solid start for the second day in a row. Colby led 2-1 and 3-2 before Trinity scored two straight goals for a 4-3 lead with 6:34 remaining to intermission. Klein scored off a free-position shot with 2:27 to go, but Coffey scored unassisted on a power move to the goal with 22 seconds to play for a 5-4 Bantam lead at the break. Klein, an All-NESCAC First Team selection, had three draw controls and two caused turnovers to go with her four goals. Crowell had four draw controls and had a free-position score in the first half. Brokaw had three caused turnovers and Kelsey Otley had three ground balls and one caused turnover. Izzy Scribano had four saves to earn the win in goal. Zoe Ferguson, an All-NESCAC First Team pick, also made four saves. Henning improved her coaching record at Colby to 135-46 in 10 seasons. She received some motivating help for her team from former captain and All-American defender Jamie Enos '08, who led the first NESCAC title team from 2008. Enos wrote a letter to the team after Saturday's semifinal win over Middlebury. "We read Jamie's entire letter to the team," Henning said. "She wrote a lot about trusting each other and trusting our preparation that got us to this point. She also talked about how the entire CWL family was rooting for us and watching the webcast from all over the country." The current players and the former players had a day no one will soon forget. The Mules will travel to Middlebury College for the second weekend in a row. The Panthers and Plymouth State play an opening round game Saturday. Colby will face the winner of that game on Sunday. Should the Mules advance past the second round, Colby will play the winner of the Denison College/Brockport State game in the third round. The Mules (15-3 overall) will be making their ninth appearance in the NCAA tourney. Colby has made the national quarterfinals four times. Colby received an automatic bid to the national tourney after Sunday's 13-9 win over Trinity College in the NESCAC championship game. Colby's favorite number was 20 on Sunday. The Mules won their 20th NESCAC playoff game after No. 20 Emilie Klein led the way with four goals. The upcoming NCAA game will be the 20th in school history, with the Mules holding an 11-8 record. Besides Colby and Middlebury, the NESCAC has Trinity, Hamilton College, and Wesleyan University heading to the national tourney. With 7 goals, incl. the game-winning goal in the final, and 1 assist in our semi & final wins, Kendall Smith is NESCAC Player of the Week! 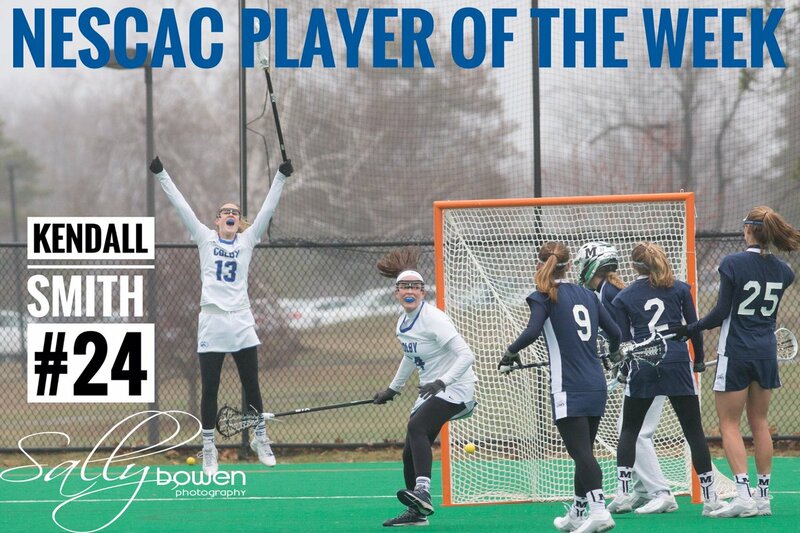 WATERVILLE, Maine -- Colby College's Kendall Smith (Glen Ridge, N.J.), who scored the game-winning goal in the New England Small College Athletic Conference championship game, was honored Monday as the NESCAC Women's Lacrosse Player of the Week. Smith had seven goals and one assist in the championship and semifinal victories. She had three goals and one assist in the Mules' 13-9 title game win over Trinity College. Smith scored with 13:15 left in the game to give Colby a 10-9 lead and then tallied 44 seconds later as part of a 6-0 scoring run. Smith had one draw control in the Trinity game and it was a big one. She won the draw and later was fouled to set up her free-position goal to give the Mules the lead for good at 10-9. Madeleine Hatch set up Smith's goal 44 seconds later to give the Mules some breathing room. Smith added four goals in a 10-9 semifinal victory over Middlebury College. She had half of her team's goals in the opening 30 minutes to help the Mules to a 6-5 lead. Smith scored her fourth goal of the game to break 7-7 tie in the second half. In the latest NESCAC statistics, Smith is tied for fourth in the league in goals scored (45) and tied for sixth in total points (51). She also was fourth in conference game goals at 24 during the regular season. A junior attacker, Smith has 86 goals and 32 assists for 118 career points for third-ranked Colby (15-3 overall). WATERVILLE, Maine -- Colby College, the New England Small College Athletic Conference champions, moved from fifth to third in the latest Intercollegiate Women's Lacrosse Coaches Association poll. The Mules, winners of 13 straight games, had one of 20 first-place votes. Colby won the NESCAC title with a 13-9 win over Trinity College at Middlebury College on Sunday. Colby also took a 10-9 semifinal victory over Middlebury. The Mules will get an NCAA opening round bye and then face the winner of Saturday's first round game between Middlebury and Plymouth State on Sunday at Middlebury. Colby is one of six NESCAC teams in the national poll. Middlebury dropped from sixth to eighth in the rankings, while Trinity moved up from 12th to 10th. S/O to @pattysmith97 for making this highlight video for us!